Searching for a Secure Visitor Management System – without a large investment of time and money? 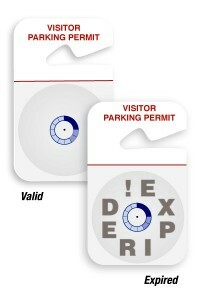 No ordinary visitor badge offers the security and benefits of the Expiring TEMPbadge. 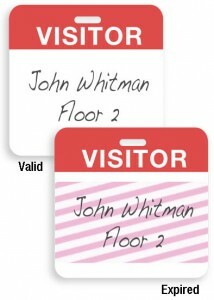 These visitor badges are ideal for use in office buildings, schools, hospitals and any facility that require visitors to check in when entering. In addition to tracking your visitors, TEMPbadge gives you the ability to control their time limit as a visitor. TEMPbadges are unique as it changes color when the time allotted expires. The timed color change is highly visible from a distance. Control visits from vendors, temporary workers, volunteers, or any other guest who enters your facility. TEMPbadges are available in 4 expiration time frames; half-day, one-day, one-week and one-month. Choose from Visitor, Vendor, Temporary or Contractor. 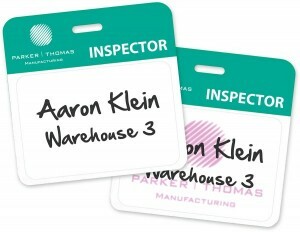 The expiring badges can also be customized with your Company Logo. No more illegible handwritten names written in log books, these badges can be printed using your inkjet or laser printer! The solution is flexible and customizable to meet the needs of small and enterprise organizations. Improves security by enabling organizations to identify the visitors in their facility. Easily recognize the length of time the badge is valid. Easily distinguish between different categories of visitors. 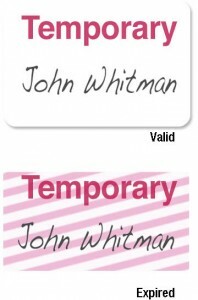 Once a TEMPbadge is activated, the expiration process cannot be reversed. It is impossible to separate the FRONTpart from the BACKpart without visibly damaging the badge. The adhesive FRONTpart is made of a specially coated material that looks like paper, but is tear-resistant and durable. Even if an attempt is made to separate the two parts, the TIMEbadge will continue to change color. 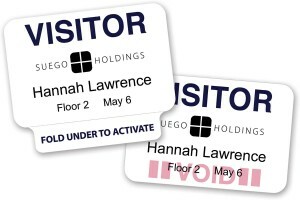 View the entire product line of TEMPbadges today at www.3idcards.com by clicking on VISITOR MANAGEMENT. Or simply give our friendly support staff a call at 800-316-7304. 3iD offers better products, better service, better prices to our customers. Thank you for your loyalty!